Daclatasvir (BMS-790052) is a highly selective inhibitor of HCV NS5A with EC50 of 9-50 pM, for a broad range of HCV replicon genotypes and the JFH-1 genotype 2a infectious virus in cell culture. Phase 3. Sensitivity of PR63cc to the combinatory treatment with asunaprevir and daclatasvir. Huh7.5.1 cells infected with PR63cc or JFH1 at an MOI of 0.05 for 3 days were treated with either asunaprevir, daclatasvir or in combination for another 3 days. 40 nM asunaprevir and 0.05 nM daclatasvir, approximately the EC50 concentration of the each inhibitor for JFH1, were used. The antiviral efficiency of each compound was evaluated by quantifying the intracellular HCV RNA by RT-qPCR. Data were expressed as the percentage of mock treatment control. The error bars were calculated from two independent experiments. ns, P > 0.05. *, P < 0.05. HCV replicon genotype 1b cells were passaged in the presence of G418 alone (medium 694 control) or G418 with miravirsen, SPC4729 (oligonucleotide negative control) or telaprevir for 28 days in fixed concentrations at a multiple (X) of the EC50 of miravirsen or telaprevir. Colony formation was assessed by staining surviving cells with crystal violet. Lomibuvir (VX-222, VCH-222) is a novel, potent and selective inhibitor of HCV polymerase with IC50 of 0.94-1.2 μM, 15.3-fold less effective for mutant M423T, and 108-fold less effective for mutant I482L. Phase 2. Genetic barriers of JTK-853, NNI-A, PF-868554, VX-222, PSI-6130, BMS-790052, and TMC435 for Con1. VX-222 and the other DAAs were treated at 1/3xEC90 for 17 days. Asunaprevir is an orally bioavailable inhibitor of the hepatitis C virus enzyme serine protease NS3 that is necessary for protein processing required for viral replication. Glecaprevir is a hepatitis C virus (HCV) nonstructural (NS) protein 3/4A protease inhibitor that targets the the viral RNA replication. It displays IC50 values ranging from 3.5 to 11.3 nM for clinical isolates of HCV genotypes 1a, 1b, 2a, 2b, 3a, 4a, 5a, and 6a. Elbasvir is an NS5A inhibitor, preventing hepatitis C viral RNA replication and virion assembly. Median EC50 values range from 0.2 to 3600 pmol/L, based on genotype. Tizoxanide, a thiazolide anti-infective, is active against anaerobic bacteria, protozoa, and a range of viruses in cell culture models, and is currently in phase II clinical development for treating chronic hepatitis C.
Dasabuvir(ABT-333) is a non-nucleoside inhibitor of NS5B viral RNA-dependent RNA polymerase that inhibits recombinant NS5B polymerases derived from HCV genotype 1a and 1b clinical isolates with IC50 values between 2.2 and 10.7 nM. It is at least 7,000-fold selective for the inhibition of HCV genotype 1 polymerases over human/mammalian polymerases. Paritaprevir (ABT-450) is a nonstructural (NS) protein 3/4A protease inhibitor. Ombitasvir (ABT-267) is an inhibitor of the HCV non-structural protein 5A with antiviral activity. PSI-6206 (RO-2433, GS-331007) is a potent inhibitor of the hepatitis C virus RNA-dependent RNA polymerase, targeting NS5B polymerase. Daclatasvir is an orally available antiviral agent that inhibits the NS5A region of the hepatitis C virus (HCV) used for the treatment of chronic HCV genotype 1 and 3 infection. Grazoprevir anhydrous is a Hepatitis C Virus NS3/4A Protease inhibitor with IC50 values of 7pM, 4pM, and 62pM for HCV genotype 1a, 1B, and 4 respectively. 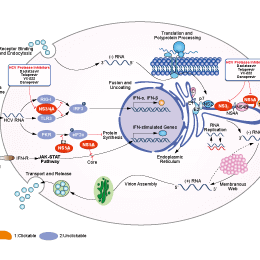 (C) Impact of HCV clearance by DAA treatment on the Nrf2 nuclear translocation. HCV infected Huh-7.5 cells day 12 were given two rounds of antiviral treatment with IFN-α, sofosbuvir, ledipasvir or combination of sofosbuvir plus ledipasvir. After 72 hours, cells were split, and then treated again with the same antiviral agent. After two rounds of antiviral treatment, the expressions of HCV core and pNrf2 were measured by immunostaining. Lycorine, a natural alkaloid extracted from the Amaryllidaceae plant family, has been reported to exhibit a wide range of physiological effects, including the potential effect against cancer. It is an HCV inhibitor with strong activity. Boceprevir is an oral, direct acting hepatitis C virus (HCV) protease inhibitor with Ki value of 14 nM for NS3. It is used in combination with other antiviral agents in the treatment of chronic hepatitis C, genotype 1. Simeprevir is a competitive, reversible, macrocyclic, noncovalent hepatitis C virus (HCV) NS3/4A protease inhibitor that acts directly against the hepatitis C virus. It has a medium inhibitory concentration (IC50) <13 nM for all HCV NS3/4A enzymes(genotypes 1a, 1b, 2, 4, 5, and 6), but has an IC50 value of 37 nM for genotype 3.